We are one of the prominent manufacturers of Aluminum Furniture. Our products are charming & alluring and are a perfect example of craftsmanship. The metal that is used for the production process is aluminum that is lightweight and can be easily molded. Moreover, our products are also rust free and malleable in nature. Aluminum is in abundance in the earth's crust and is also soft. We are one of the leading manufacturers and suppliers of a designer range of Aluminum Outdoor furniture. Our organization is amongst the highly trusted manufacturer, supplier and exporter of supreme quality range of Premier Range Table. We are offering excellent furniture items for accommodating clients, visitors and employees in lobby areas, lounges and receiving areas. These are made up of high quality raw material purchase from reputed vendors. 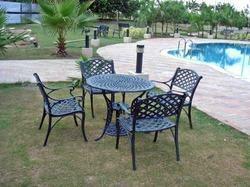 Wrought iron garden furniture is durable for all the basic requirements of the gardens.